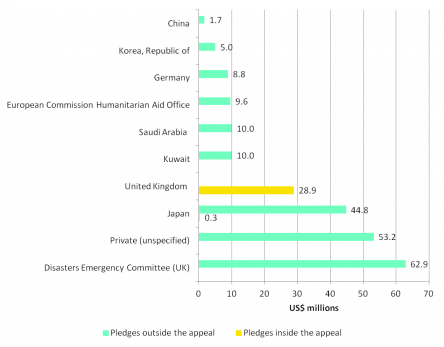 Typhoon Haiyan funding update: steady increase overall, big increases from UK, Netherlands and Japan. Thirteen days after the typhoon struck the Philippines, delivery of assistance increases as access by air, ferry and road improves. However, it is still difficult to reach communities in the most remote areas. Of the 13.5 million people affected by the typhoon, 4.4 million people remain displaced. According to OCHA, the Philippines Government estimates that most of these people (4 million) are living outside evacuation centres, and 387,450 are spread across 1,552 evacuation centres. 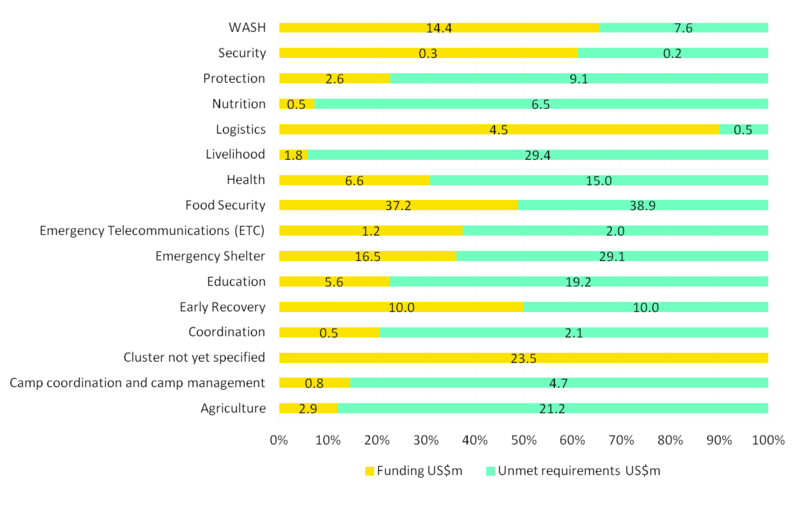 As figure 7 below shows, there is a slow and steady rise in funding so far, without any of the peaks in giving that have been seen in other major disasters. 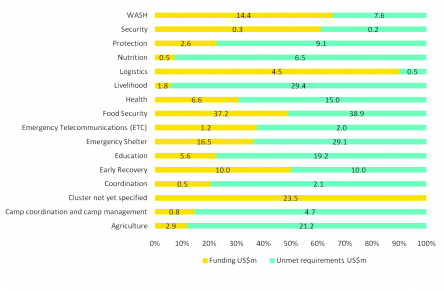 Total reported funding to the emergency has reached US$279 million – an increase of US$37.6 million. 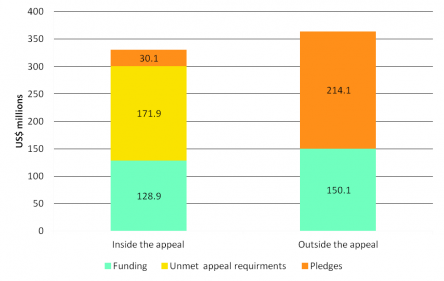 In addition to the financial assistance reported to the Financial Tracking Service (FTS), the Philippines Government’s Foreign Aid Transparency Hub reports that almost $140million has been pledged in in-kind assistance. Funding to the UN appeal is now up to US$129 million from US$112 million yesterday – 43% of appeal requirements are now met. There has also been a significant increase in reported funding from the Netherlands, up from US$68,911 to US$6.6 million and from Japan, up from US$ 607,000 to US$7.3 million. 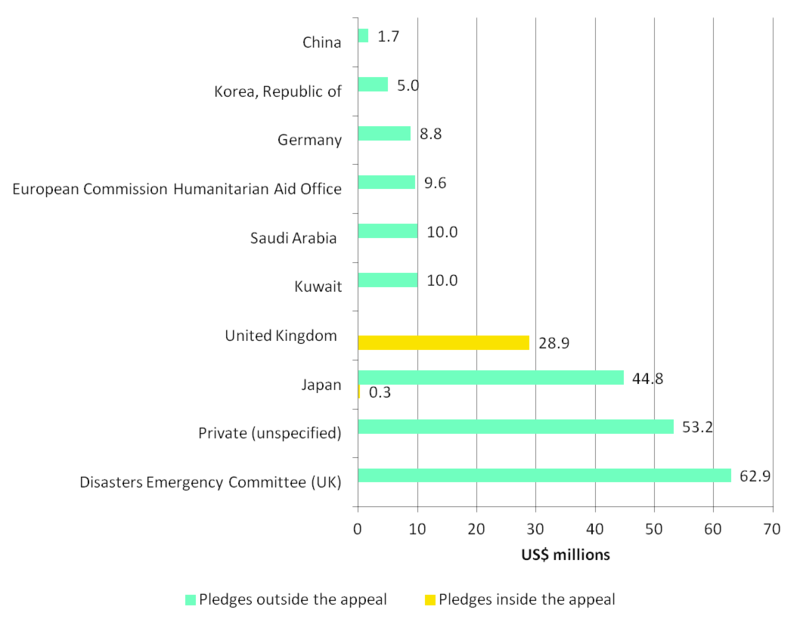 Japan’s pledges are up from US$10 million yesterday to US$45 million. The only new donor since yesterday is Iceland (US$100,000). 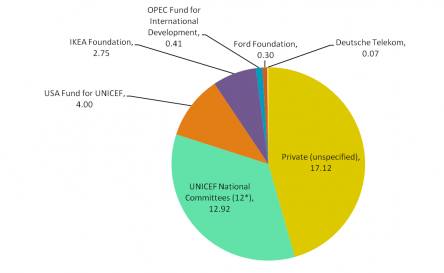 Real time data is made available by UN OCHA Financial Tracking Service (FTS). This data is being constantly updated – the figures used in this blog are based on FTS data downloaded at 08:00 today (21 November). 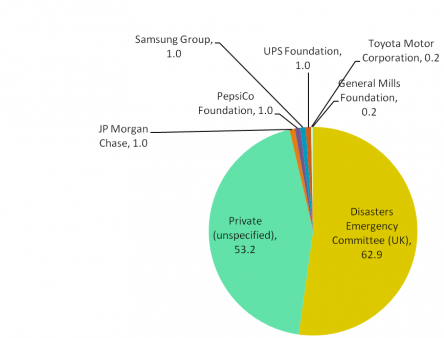 The following graph shows total funding to the Philippines Typhoon Haiyan emergency, compared to funding to other major disasters on a day by day basis. 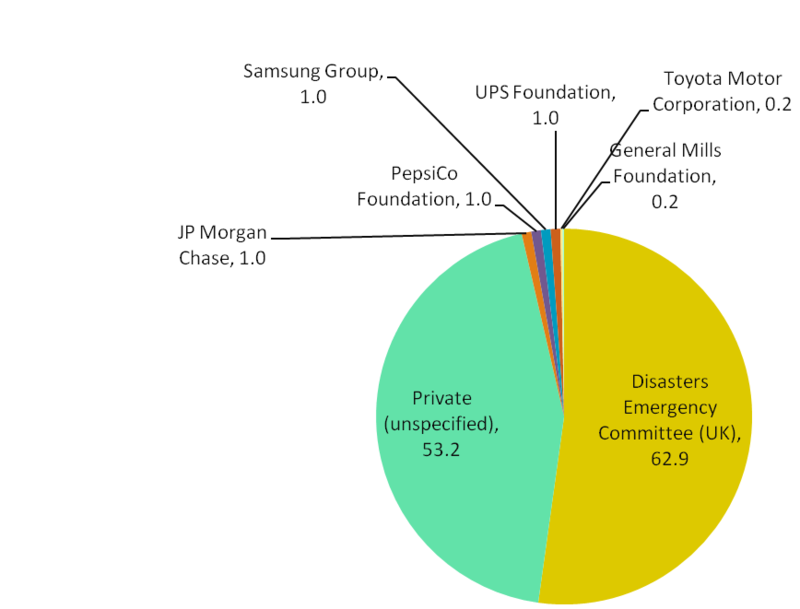 The number of people affected by these disasters varied significantly – Indian Ocean earthquake tsunami 2.3 million, Haiti earthquake 3.7 million, Pakistan floods 20 million, and Philippines typhoon 12.9 million. Over five times as many people are estimated to be affected by Haiyan than by the 2004 Indian Ocean earthquake tsunami, however, the response is markedly smaller and slower.